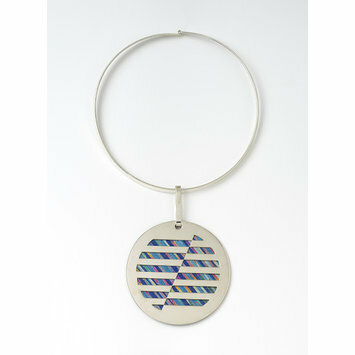 The 1970s saw much experimentation with new materials in jewellery. Amongst the most colourful was the refractory metal titanium, with its iridescent surface colouring achieved by passing controlled electric currents through the metal. This pendant by the Milan-based jeweller James Rivière (born 1949) is an interesting and relatively early example of titanium being used in jewellery. 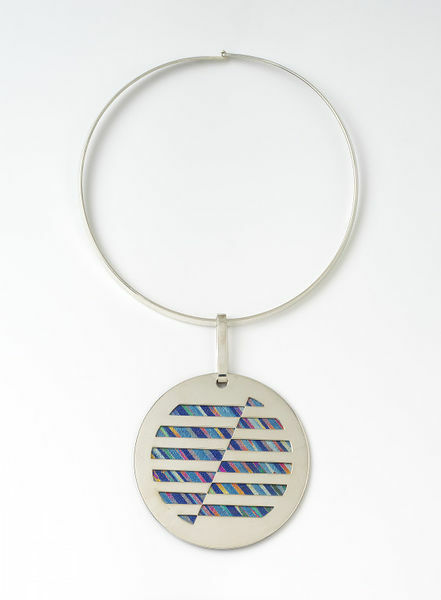 The design of the pendant, with its layered patterning of parallel lines, was influenced by Op or Optical Art, and relates to themes being explored by Rivière from the late 1960s.